Happy Monday to you! Today I want to share with you a fun addition to my son’s wedding last month. (I can’t believe it was nearly a month ago!) I saw the idea on Pinterest and ran it by my son and his fiancé at the time and they loved it! It was providing hankies for happy tears at the wedding! I saw the idea for providing vintage hankies for happy tears on Pinterest and thought it was such a sweet idea. My son’s fiancé loved the idea but she preferred all white handkerchiefs. 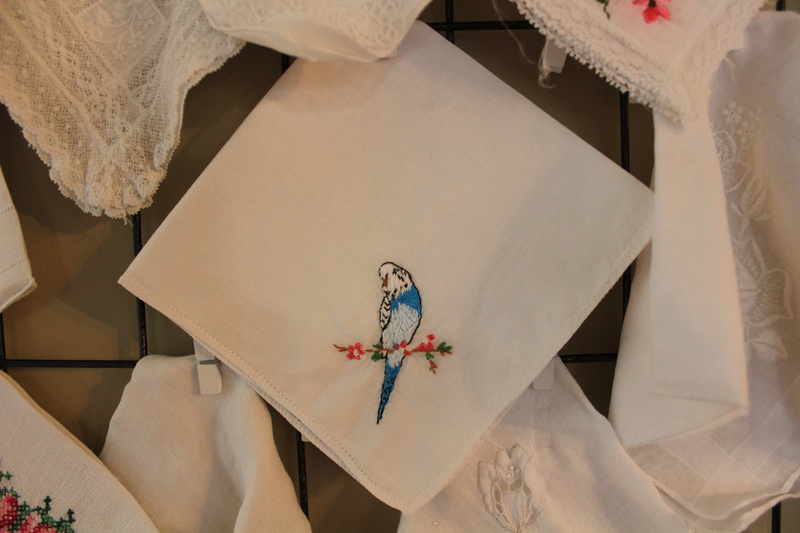 So, at once I started shopping antique stores and online for lots of white or mostly white vintage hankies. Ebay is a great source for buying lots of vintage hankies. Mostly they are in mint condition but others, not so much. In each case I washed and pressed them. Sometimes when you purchase a lot of hankies from a seller a few are not in ideal shape so I tossed ones that were beyond repair and kept the more colorful ones for future use. All of the white ones we used for the wedding. I use Retro Clean to wash the hankies, which is gentle on vintage fabrics but still strong enough to bleach out stains. This is a lot of hankies my sister purchased for me at an auction. Only a few were all white, so I was only able to use two or three for the wedding. The rest of the hankies for the wedding were purchased at antique stores or on eBay. Some of them had light stains but otherwise in good condition. Look how pretty they turned out once they were washed and pressed! So, the next order of business once I collected enough hankies was to figure out how to present them at the wedding. When I saw the idea on Pinterest, they had them in a basket on a table. But I wanted to display the hankies in a way that would allow people to see the different ones and pick out their favorite. Some had a “B” on them which was perfect because both sides of our family has a last name that begins with the letter B. Some had other letters stitched into them, some had butterflies and flowers. Each one is different and so pretty, like a snowflake! I left the frame and the hankies at the venue and the wedding planner thought it was for displaying the wedding favors which were keys/bottle openers. It did look great this way, but alas the frame was intended for the hankies. So, once I explained about the hankies, the wedding planner made the switch. Here is the frame in my kitchen with some of the remaining hankies. Somehow I missed getting a picture of it at the wedding, (shucks) but you get the idea. So, now that the wedding is over, my new plan for this frame is to use it to hold Christmas cards! I must get my money out of it, right?? I just need to buy more of the tiny white clothespins. Go figure, I have a 40% off coupon now.